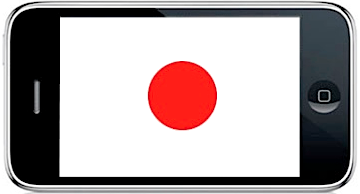 iPhone shipments to Japan has doubled within the last year and the iPhone controls 72% of the smartphone market. According to numbers from MM Research Institute Apple has sold almost 1.69 million iPhones between March 31st 2009 and March 31st 2010. In the same time there has been 2.3 million phones sold in Japan. So 74% of the phones sold in the last year were iPhones. Apple leads the smartphone market in Japan with %72 followed by HTC with 11% then Toshiba with 6.8%. The iPhone provider in Japan is Softbank Mobile. Which reminds me, we never saw Mobily announce their iPhone sales numbers in Saudi Arabia. Well I also heard that on two year contract, the iphone handset is almost free in Japan.